Members from the national church next door called Dabelle Baptist helped us paint, clean, and dig for this first build. Workshop and Guestroom COMPLETE! Hello again from the RVA team! It has been a while since we wrote a long update, but please don’t misunderstand our silence for a lull in the plans for RVA or for our family. We have been beautifully busy in a blessed kind of way! Let’s get caught up! We are thankful to announce again that the funds for the Phase 1 buildings of the RVA project have been raised thanks to the matching grant that we were blessed with last fall. Thank you to everyone who has given so generously. We know that there are many good charities that you could’ve given towards but you chose to make a difference in the lives of the kids of the Ramu Valley and we are THANKFUL!!!! They have no idea what the Lord is doing on their behalf at the moment! What a loving Father to provide for his needy children through his other children who he has blessed with so much! It must please Him very much. So THANK YOU! Thank you for DOING SOMETHING about a real need in the universal Body of Christ! As most of you know, as soon as the funds were promised and met the Phase 1 goal, we began to order some of the supplies that would need to come on a container from overseas and we are anxiously waiting its arrival. While we waited, we began building the workshop and a small guest room above that work shop (see picture above). This build took from January 15th – February 20th and will be the staging area for all other builds that will happen over the next 2-3 years. We are thrilled to have completed this workshop within budget and with a water well, a guest room, a water tank and power! Praises to a God who brought needed help from NTM, from Australia and from the national church next door to be an encouragement and to show his love through them to us. What a beautiful testimony! Thanks to all who stopped by to encourage, talk, and work with us! Once we finished the workshop, we were still waiting on the materials on the container from the US for the first school building. So, we took the rest of the furlough that we skipped out of last year. 🙂 This put us home for two months (March-May) and allows us to hit three birthdays, Sabra’s college graduation and her husband, Austin’s, graduation from seminary… and Mother’s Day! So, we are currently writing from America where we are getting plenty of granddaughter snuggles and enjoying seeing our family on a more regular basis. The girls are both doing well in their marriages and lives and this gives us great joy. Our parents are all still faithfully serving the King as they walk with us towards the finish line. We all want to hear him say, “Well done” and we are undeservedly blessed. Please continue to pray for our church elders and believers there in the Ramu Valley and for Promise Vaughan as she faithfully works at connecting believers back to the Word and to each other as the Body of Christ. This is hard, long work and we are thankful for those who are praying for wisdom for each day’s worries. Anton and his family are doing well after the loss of his adopted 4 year old son last December. He has been able to move around and encourage the churches again and is looking to adopt another son in the coming year. Right now another matter for prayer is a big “hevi” with Promise’s main translation helper. She is a very sweet and godly woman and is married to a very unbelieving and promiscuous man. I think only the Lord truly sees the struggles this faithful woman has been through. Please pray for her and for the Itutang church and Promise as they seek to encourage and help her and her children. SUMMER PLANS..and TEAMS FROM THE U.S.ofA.! After Austin’s graduation, we will hit the international road again and head back home to PNG. We cherish the time with our family and friends here, but we are blessed to have been given a joy and passion for the work the Lord has so kindly given us with RVA. So, it is with both tears and excitement that we will transition from “home” to “home” as we continue our sojourn here on earth. Once on the ground in PNG, we will be busy gathering materials and supplies (and hopefully receiving our container!) and making preparations for our first work team. We have FIVE teams of different sizes and from different states getting ready with passports and visas as we speak. These teams will be rolling in one after another from May to September. Please pray for these guys and gals who are coming from Middle TN, East TN, California, Georgia, Kentucky and Indiana. We are again SO blessed. Pray especially for our co-workers who will be joining us full-time as RVA staff this summer. More about their journey and how you can help in our next update. So, we have much work ahead of us to do and many hands will make it lighter for sure. There will still be more space for YOU to help this coming fall or in the spring or summer of 2020. He left all of us only one job…”Make disciple of ALL nations” and all of us are supposed to be DOING that someway, somehow. So, if you know someone who isn’t sure what they are DOING to reach the nations and wants to know HOW to be more involved in either GOING or SENDING, please contact us and help them get in touch with the Great Commission in a more intimate way this year! Pray for the individuals and teams coming to serve this summer – visas, safety traveling and on the job, health, and for attitudes of service and JOY in their lives from seeing the needs that can be met through what the Lord has blessed them with. Pray for The Kitchens family who are joining us full time this summer as they are raising their support and transitioning their family of 6 into a brand new culture and life abroad. Pray for Wisdom as we buy supplies and build. We are building as low maintenance as possible which is sometimes more costly, but we are thankful for all the excellent expert advice we are gathering along the way. Pray for the first students of RVA, that the Lord would prepare them in heart and soul for what is ahead and start now giving them a passion for the Harvest Work in their backyard. Pray for Meetings this summer and fall with provincial government and educational personnel to get our school certified as its own entity and to comply with national government standards. Friends, we couldn’t be DOING this here without you all SENDING us from there. THANK YOU. Please continue to ask the Lord for grace and mercy for us as we walk forward where he leads. 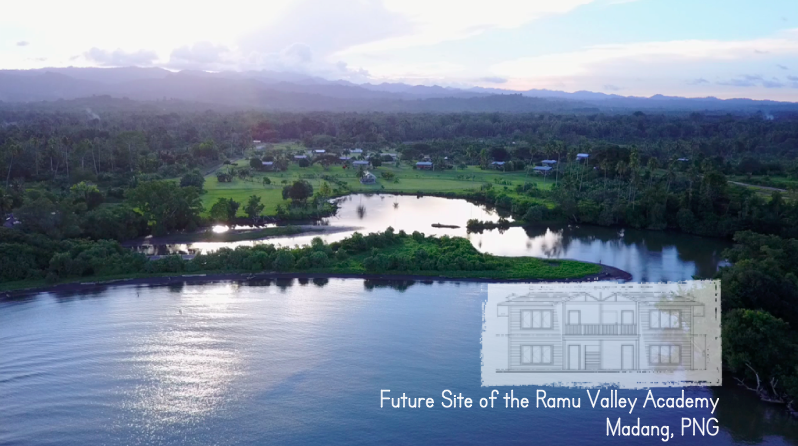 We want more than anything to see men and women of the Ramu to be equipped and empowered to work alongside us interdependently to see JESUS CHRIST and HIS SAVING POWER ALONE proclaimed from one side of PNG to the other. He is Worth it! When the “Spotlight of Suffering” shines on you, what will you do? As promised, we are writing today with an update about the tragedy that happened at the Guam River just feet from our back porch this past month. As you read this, please pray for Anton and his family as they continue to grieve for their lost adopted son. Exactly one week later, December 11, Tuesday afternoon – Anton was helping the young men build a grand stand area for the upcoming soccer tournament that our village would be hosting this year. There would be 14 soccer teams and 12 volleyball teams from all over the Ramu Valley descending onto our little village. Many prayers had gone up for weeks now for safety and peace among the players…and for LIGHT. The believers were praying that God’s light would be seen by those who had not yet heard the Good News in their own language yet. The soccer field was ready and the trophies had been bought in town and were ready to be placed in the grandstand. We were thankful for Anton and his concern for the young men of the community and the way he used his time to connect with them even though he himself doesn’t play soccer. He went out early Tuesday morning and began working beside the boys. His wife, Ogagarasem, had worked with Anton and the rest of the family to wash additional sago, the local staple, to have on hand for the number of visitors coming over the weekend and now she was going out to their swampland to try and bring additional fish to the menu as well. She took along her 12 year old daughter, Lydia, as well. The day started as any other. Ogagarasem’s younger sister, Jorjina, a caring and usually meticulous caregiver was watching Anton’s other three smaller children. Denəva, was working around the house with Jorjina, doing what little girls do. Darin, 7 years old, was following a neighbor and using his round net to try and catch small fish to use for bait later. The river was high and running fast and he kept close to the edge as he threw the fish he caught into the dugout canoe nearby. Sarəstən, their 3 year old son was in the stilted cooking house with the older girls, but cried to go down the ladder to watch Darin catch fish. Sarəstən was adopted when he was only a few months old from an island called Karkar. He was a bright and friendly soul and would call out and offer food to people who were passing by. He knew people’s names – including ours, but he liked to call Bill “Mangi” which means, “little boy” in the national creole. The neighbor got permission to let him down and then left as Jorjina was headed down after him. As with many accidents, the next moments were blurred and only God knows which story is the one that truly happened next. I left the metal classroom building with one of our teachers, Markus. We had been going over the diagnostics that we were using to test the grade 6 and 7 students there. He followed me to my house, which sits next to Anton’s, and then he went down to see Anton’s children (his nieces and nephews) before heading home. As I stood on the porch, I heard the older girls begin to ask if he had seen Sarəstən. I went back down to the river edge and we began to call for him. We looked along the bank, in the houses, around the school area. Markus ran to get Anton and make sure that Sarəstən hadn’t taken off with someone to see his dad at the soccer field. Nothing. It seems the last one to see him was his brother, Darin, who said that Sarəstən had been standing on the bank and was watching him catch fish and then went back up on the bank a little. The best guess is that he walked over to the canoe to take a look at the fish that had already been caught and slipped into the rushing water between the bank and the canoe…and entered eternity. It was two hours before they could get to his mom and bring her back home where the village full on wailing and searching. I cancelled school testing. The young men cancelled tournament practice and drills. Work stopped all over the village and people came together to comb the water. They searched the clear areas and then began breaking up the logs jams as they checked in them. For three days, we searched. Nothing. Meanwhile, without any closure, the mourning was ongoing day and night. As unbelievers also came to search and mourn, they brought their stories with them. Consider the grief of losing a child this way, no idea of what actually happened, no body, no closure. Then, add to this the great animistic skill of hypothesizing and storytelling…it’s brutal. Anton and Ogagarasem heard accusations that they were bad parents leaving their children at home (although they were left in very capable hands and did nothing that every other family in the village doesn’t do every single day). They heard that they were to blame because they weren’t there. Jealous accusations came and they heard that they were to blame because they stay at the house too much like a white man (Anton had saved his money up several years ago and has a tin roof and water tank for his family to have fresh water, but still is on of the hardest workers with one of the biggest gardens in our area.) They heard that it was Ogagarasem’s little sister’s fault and that she should beaten and they heard threats that she would be killed. They heard that he wasn’t really in the water, that he would be like another village story that happened over a decade ago, where the boy showed up five days later, just lost in a garden. They heard that it was the spirit of another girl who drowned about 7 years ago in the same river and that she pulled him in. Days and days of lies compounding the pain of losing a child to this fast flowing body of water. I watched them sit at the bank and weep helplessly looking at the place where he was last seen. I could only imagine the sifting that was going on in their hearts and minds and wondered, “What would be sifted out as lies and what would prevail as truth? What will this do to their faith?” Mourning went on through the night for days. Our bed is only 50 feet from their house and so when a new round of wailing hit the night air, we would wake and pray quietly in our beds, begging God for strength and mercy for Anton and his family. Wednesday and Thursday – these days were a blur, but Bill and Promise and I along with other believers all took turns speaking words of comfort and truth and encouragement, but these were hard, sifting days. One believing friend came and reminded Anton of the pain of King David when he lost a child and reminded him that God gives life and takes it away – no one else. He encouraged them to eat something. About 30 minutes later, Anton asked for a plate of corn that had been cooked to be brought over and they ate it. A woman came by and spoke to them and reminded them of the suffering of Job. She reminded them that Job was blameless and yet was tried and, in the end, blessed. She encouraged them toward belief in God’s goodness as well as his sovereignty in this hard pain. This tragedy was a blow – a swift and painful one. The impact left this sweet couple wounded, raw, and open…and all eyes were on Anton and his wife. Would they blame the sister? Would they call for her to be beaten or killed? Would they blame God? Would Anton forsake the sovereign and good God that he always preaches about to others? The spiritual battle roared over our village for 4 days as we searched for a little brown body…and prayed..and waited. December 14th, Friday morning about 10am – Anton and his wife walked over and said that they wanted us to eat with them. We said that of course we would and asked why. They said that they wanted to cook for the village and that we were invited. We offered to help with the cooking and donated some food as well. That night, as the sun sank over our village, 4 days after the river had swept a village son from all of us, we gathered in silence to hear Anton speak and to eat with the grieving family. Work and play had stopped out of respect for the family, but the soccer tournament officials had already begun to arrive and were also gathered with us now. Everyone was here waiting to hear what would happen next. Thank you all for coming to eat with us tonight. You know that we have had a big heavy come to our family. It is a very hard thing to have a son taken from us like this and not to have a body to bury. I don’t know why this happened to us, but I have heard many stories from some of you. I want you to hear this well. When you come to my house, don’t be talking about how you think he died or about him at all. It hurts too much. Some of you are saying that a sanguma got him or that the spirit of the water took him. I don’t believe these stories. You who are believers in Jesus know what God’s Word says. God is the only one who gives life and he is the only one who takes it away. God took Sarəstən. He doesn’t tell us in his Word exactly what happens to little ones like this who are too young to understand their sin and the Good News. But, Sarəstən, at his mark, knew who God was. He asked me last week who made the water as we were walking through the bush and I told him God did. God gives life and God takes life. Last week, I was walking with Bill and telling him that I haven’t had any hard heavies come up in my life. This was true. Now, Ogagarasem and I have had this very painful heavy come up in our life and it is good that we are tested. I have spoken strongly with many of you about the goodness and power of God and I am going to stand up on God’s Word still. I am not angry at anyone. Although, I may not come to the games, I want you boys to resume practice and to play. I also want to tell you boys thank you for taking time to help me search for my son. Play your soccer games and play well and don’t be worried about playing while this heavy is still with us. I want the rest of you all to go back to work. Sarəstən is in God’s hands. The speech was not without tears and moments of silence and afterwards Anton came over and held our hands as he talked with Promise and Bill and I. He thanked us for praying for him these past days. He said that he knew that many people were praying because even though many people spoke truth to him, it hadn’t help him rein in his thoughts and doubts. He was really struggling with the goodness and sovereignty of God for the past three days. But then, that Thursday night, he was alone and he said God just assured him through his Word that this was in his hands and He could trust him. Nothing about God had changed since Tuesday. God was the same. There were many more moments that made us stand in awe of the power of God and to give praise that He gives His Holy Spirit to indwell and to help and empower mere mortals to fight these spiritual battles. And, later that next week, Bill was moved to see Anton out on the soccer field with all the young men around him as he prayed for them before their game. There is light here in the Ramu Valley. Light that brings peace that passes all understanding. What a blessing to know these people. To see their raw lives that cling unashamedly to Christ. To see true faith in a community in action. To see the Spotlight of Suffering reflected and magnified to honor Christ as the tragic story was spread along to the neighboring people groups who came to see a soccer game, but brushed up against an ambassador of Light of the World. Pray that Anton and his family’s grief will be comforted and that they will use this experience to comfort others as the Spotlight of Suffering singles out the true children of the Suffering Servant and allows those who believe to experience the momentary afflictions and prepare for us an eternal weight of glory beyond all comparisons. Anton was an animist eleven years ago. Today he is one of my spiritual heroes and mentors. Today – When the spotlight of suffering shines on you, what will you do? Author inapangministriesPosted on December 31, 2018 December 27, 2018 Leave a comment on When the “Spotlight of Suffering” shines on you, what will you do? The Ramu Valley Academy grew out of an interdependent vision between us, our sending churches, and the tribal churches we serve int eh Ramu Valley. RVA’s vision is to provide an educational venue that combines foundation Bible teaching, practical skills & discipleship, quality education, and safety for the children of our NTM-PNG church plants to learn more about their world and its Creator – to know Him more and to make Him known throughout the Ramu Valley and PNG. This vision is slowly BEGINNING to move to reality thanks to a gracious God and YOU – the conduits of the physical graces of help and financial support! Thanks to all of you who have been praying and giving towards the Ramu Valley Academy project! As you know, we began raising funds February of 2018 for the first phase of the school project which includes three teachers houses, three classrooms, a washroom, a workshop and a manager’s flat. As of the end of December of 2018, the funds for this phase of construction has been raised/ promised! It’s time for work to BEGIN!!!! We are praising God for the way He has gone before us and stirred up hearts to PRAY and GIVE and GET INVOLVED! Our School Administrator, Eric Kitchens, will be en route to PNG with his family this year and we also have a couple of building teams lined up as well to pull your funds into a physical construct where learning can take BEGIN to take place. There are so many working on this from the various angles of construction, legal, educational, curriculum development, logistics and shipping materials, etc, etc. We are so thankful to be part of a larger global team who want to see this educational facility serve its stated purpose! Please continue to pray for us as we move forward. We are praying Psalm 90:17 – the same way we did so many years ago as we walked wide-eyed up the mountain of tribal church planting among the Inapang people group. “Let the favor of the Lord our God be upon us, and establish the work of our hands; yes, establish the work of our hands!” Please pray this with us! Pray as we develop a curriculum that will best serve the ESL and other needs of our students who are coming from rural and often failing educational systems. Pray that the Lord will grant us favor in the eyes of the government and other officials that we will need approval from. Pray for those who are working with us on the legal and financial sides to keep us above reproach as we form this new school. Pray for our Board of Directors who are located in both the US and here in PNG – both ex-pat and citizens, that we would have wisdom as we walk forward. Pray for the students. Pray that hearts would be softened and open to the gospel. Pray for hearts that will serve their local churches and communities. Pray that Christ will be made known through their lives and that the education we provide will propel the Great Commission here in PNG. Pray for those of us who will teach and disciple that we would be sensitive tot he Holy Spirit and speak truth in our daily lives. Pray that we would be loving, gracious, kind and yet courageous to do what He calls us to do next as we move forward with the RVA vision. It is not without adversity, within and without, that we go forward. And yet, the support and encouragement both here in country and overseas has been overwhelmingly encouraging to us as we walk where He leads us. Pray for physical strength and safety as we begin building in the coming weeks and continue to work with teams through the summer. Thanks for taking time to read this RVA update and to commit these things to Christ, our anchor and our strength. Please take time also to THANK the LORD with us for his gracious provisions! Want to do more?!! Click on the links below to see how you can BEGIN to play a bigger part in the lives of the children of the Ramu Valley! To be part of the physical BUILDING crews this summer click here: Go:BUILD! and email the address at GO:BUILD! To serve and share your gifts by TEACHING a core subject or a practical skill or sport (for a year at a time or for a shorter 1-2 week intensive course) click here: Go:TEACH! and email the address at GO:TEACH! We will BEGIN putting together a schedule and syllabus for the year 2020 very soon! We’ve just returned from a two month visit with the Inapang churches in the Ramu Valley here in PNG. What a blessing it was to be back with our citizen and ex-pat team there and to see the continued growth among our brothers and sisters. This general update is one of reflection and of encouragement and thanks. Thanks to those of you who give and pray so that we might continue to be part of the local church and life of Itutang and thanks to Jesus Christ who gives us all a reason to celebrate this community we have through his Death and Resurrection. In the coming weeks, we will be sending out two more updates following this general report of our time in Itutang. One will highlight the giving towards the Ramu Valley Academy this year and the second will be a short narrative about a horrific drowning that took place on the banks of our Guam River right outside our house and the response of the family who lost their young son. There is truly a spiritual battle going on and we are thankful that the Author of Creation saw fit to write down the “end game” to keep us encouraged in our earthly fight as we journey together towards that celestial city. We are thankful that when the King returns, all the rules change and we certainly look forward to that day when Faith becomes finally Sight. In the initial days of missionary team formation we, like most missionaries, thought that our “team” will always be these two or three families who are setting out to bring good news to a new language group. We pray, like most new teams, that we will stick it out together to see the work to its completion and maturity. Those are good and worthy and biblical thoughts and prayers, if short-sighted. Now, standing on the ridge of 15 years of church planting and look back over the valley we’ve traveled and consider what we thought then and what we hear from our local church elders today, we realize that our vision was incomplete. For us, that initial “team” formation was crucial and we were blessed with some of the best families we could’ve asked for. But, that “team” lasted only three years before the gospel intervened and transformed our “team” to include more than just us. Now, brothers and sisters from Itutang who were now filled with the same Spirit, they now had the same seeds of the weight of the Great Commission and a desire to pursue holiness growing inside them as we had. Our team had expanded. Our Body had grown. The long-term team that we often forget to strategize toward in tribal missions is truly that integrated Body of Christ. And, as we have matured alongside of them in our understanding of tribal church planting, we have come to see that our lives must bend to this Body, this team, their needs, and their community and ways of dealing with “the world” in their culture through the application of biblical teaching and practice. Finding true relationship in the world of tribal missions often means putting off your own expectations of “community” and being accepted authentically into their real lives and together functioning as the Body of Christ. These new indigenous team members are wise and godly men and women who would surprise you with their knowledge of both Scripture and…their insights into the missionaries’ lives that they have been witnessing for over a decade. We all have much to learn from them if we take time to listen. For those of us who want to be part of the answer for more interdependent relationships within the local national churches, these men and women hold a wealth of wisdom and we are thankful to be able to learn from them. The local church team and community that exists in Itutang today is one that has an inter-dependent core of leaders including ourselves, the men of God who the Lord has called to serve as elders and their wives, the church deacons and their wives, Promise Vaughan, and the believers of the Inapang churches. Our time in Itutang this CHRISTmas season was a sweet one full of care, community, and CHRIST. Our souls were fed as we sat under the elders’ teaching through 2 Peter. Our hearts were encouraged as we were cared for and encouraged by the body of Christ and the raw and real community there – a community the world would call one of poverty and yet they are rich. They are not only rich with the endurance that comes through suffering and trusting in Christ alone, but also rich in their wisdom and their hope of eternal glory. They live and long for that celestial world and their joy in that hope contagiously affects those who rub shoulders with them and gives way to new and deeper longing for the eternal inheritance than one had before. In the coming weeks, we will share with you Anton’s story – an elder in Itutang who has just experienced the terrible loss of his son. His wisdom, his grace, his faith in Christ Jesus have shown us that there is a maturity there that sometimes we fail to see in ourselves and other missionaries here on the field. Life here is not an adventure for them. It is real and raw and painful and the maturity that comes through living on the edge with nothing to hold onto but Christ is something that calls us to awe in the One True God from whom all strength comes. These believers are our heroes. The world offers them no comforts. They are men and women of whom this world is not worthy, but you will see them in heaven. They will be sitting with kings and will be enjoying the rewards of their suffering and fruit and labor and trust that they walked in during their painful years here. So many times this visit, we had people come and sit and thank us for coming and for staying and for being the mouths that brought the message of eternal salvation that they cling to now. We tell you that so that you might hear this: We could not have come with this saving message of hope without you, our team, behind us. Thank you for making a difference in their eternities. Thank you for giving. For praying. For encouraging. For visiting. Your labors also are not in vain and one day you will see the fruit of your labor, rejoicing around the Throne. And the work is certainly not done in the Ramu Valley, so please keep praying. Although our hearts long for our family at home and our hearts are heavy to be away during this holiday season, we are so thankful to be here doing what He has called us to do. We love this job and still feel the privilege and the responsibility of it every day. We long for the day when we stand before the Master of the Harvest and want more than anything to hear Him say, “Well done. You worked with my children where I sent you and with power that I gave you. Enter into your rest.” Thank you for being there so that we can be here. We are more and more convinced that our God is not just interested in the end (since He is already reigning); he is also VERY interested in the means of our lives. Sometimes the circumstances of our lives throw us headlong into unexpected and unwarranted difficulties or misunderstanding. Sometimes sinful heart issues keep us spiraling in an unloving pattern of behavior that pulls us down spiritually. Sometimes the physical pain and sicknesses of this fallen ground seem to battling to remove all truth from our hearts that God is perfectly good in his sovereignty. The unending list goes on and on like the digits of pi, which makes it quite easy in the midst of our valleys to have the truth of God’s grace in our lives suffocated by the smoke of doubt and unbelief. That is when we must be grounded in His character and what He says about the lives of His disciples (Lk.21). His Word tells me that his goal for me isn’t first and foremost about my happiness (notice I didn’t say joy) or my wealth or physical contentment or that I have a positive social network who “like” me. It’s not even that I have an overall sense of well being and comfort. No, His goal for me is much more lofty. His goal for me is to be broken, suffering, dependent…and still full of Joy. And, because of who He is, He promises not to let one sin destroy that good plan He has for me. He promises to discipline and train my heart to seek only Him…and then He does it! This past week as Bill and I sat in our little morning spot on the porch swing, we watched the sun rise over the vast Pacific Ocean. We read and prayed through the list of people and concerns that have etched their needs on our hearts the last couple of years. We also prayed again for pure hearts and for forgiveness of others as we ourselves have been forgiven. When we were done, I went upstairs to make the bed and sat for a moment looking out the window to the property down below where we want to build the Ramu Valley PNG school. I was struck once again by the hugeness of the endeavor before us and our own not-enoughness and I prayed again for His wisdom and His blessing and that He would establish the work of our hands. As I sat still on the edge of the bed, the Lord spoke the way He does when we are quiet and broken before Him and he said very clearly to my heart, “My blessing comes through repentance.” What?! I sat longer, waiting to make sense of what He was saying. And, because He is a good Father who doesn’t hide his wisdom from His children, He brought to mind something that Bill and I had forgiven, but like a child with a security blanket, were still grasping on to that one little corner. When I talked to Bill about it, he agreed and for a couple of hours that slow Saturday morning, we discussed and prayed… and we let go. It’s such a weight that is lifted when sin is confessed isn’t it? The next day was good and the national pastor at church was used as another living conduit as he spoke about the very things Bill and had discussed together the day before – even using one of the same passages. I love God’s Word and the way it is truly ALIVE and how he uses it to give direction and confirm what He is teaching us again and again. In 7 months, the Lord has been so kind to raise up the funds to this amount already. We will be going bush in just a few days and then we will be out of contact for a couple of months ‘til the NEW YEAR! 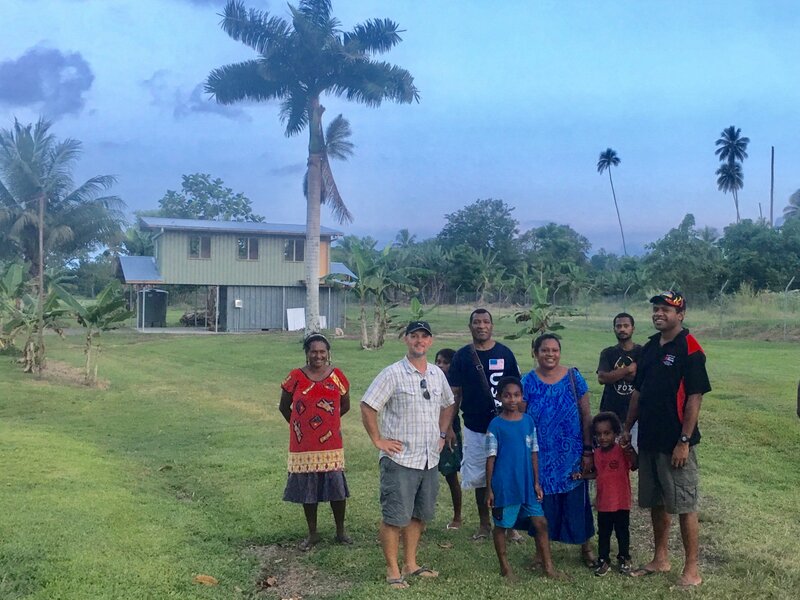 We are confident that in January of 2019, YHWH Yireh will have gathered up all the resources that we need, both finances and people, to make 2019 – the year He built a school to support the local churches here in Madang Province, PNG. Please also keep praying for the specific future students that the Lord will raise up for us to disciple here at RVA! Praising God for his provision this morning through YOU – the Body of Christ! Now, to steal from one of our heroes, William Carey… we are expecting great things from God and will attempt great things for God because #HeIsWorthy. As we write this month, our hearts are full of thanks. We have had people write and encourage and pray for us as we transition back into life in PNG and we can feel it. This transition was a bit different for us and after getting some input at home, we are settling into a routine that will hopefully keep us more emotionally and physically fit in the coming years. It stinks getting old, but is sweet to see the Lord continue to walk with us and reveal more and more and to create more and more opportunities for dependence and obedience toward Him. We are thankful for the team here in Madang – both students, staff, and Itutang friends who have made it a joy to come back. Daily struggles arise – as one of the orientees reminded us this week speaking from Colossians- but thank God…He is faithful and forgives and never leaves us or forsakes us as He works to complete the work that He began in each of us. There is truly NONE like HIM. We are also thankful for the sacrificial gifts that we see many of you have made towards the school for the sake of training a strong new generation of believers to help us reach PNG. There was a total of $27,178.01 in donations received this month!! We are so thankful for the friends who are providing the matching grant that doubled all of those donations! So blessed! That leaves us about $179,000 left to raise before we hit our goal. THANK YOU! Joshua and Amelia, our Itutang co-workers, came over to ask how it was going and we talked about how more people had given again this month and how we were getting close to the goal and Amelia’s eyes teared up and she said, “Tell them we said ‘Thank you for remembering the poor line (people) here.’ It is hard to give to people you don’t know, but God makes it so that we do things like this to help each other.” Yes. Yes, He does. We are humbled thinking about how many of you are bearing this burden with us and praying and giving as we move forward. Bill is excited to be back here on the ground now and is gathering specific price lists of materials between translation hours. Some things will need to be shipped from the U.S. and will take many months to get here, so pray that the rest of the funds will come in quickly so that we can get the ball rolling on this side. We have so many people ready to help and this, too, is a joy for us to see! We want to ask for special prayer for all the new PNG missionaries and also for our co-workers here in Madang, Aaron and Lori Luse, who are functioning now in our former roles as Church Development Director and Orientation Coordinators training new missionaries. They have strong hearts for the church and the gospel and also still have school aged children at home. They are doing a fantastic job and we would appreciate your prayers for them for wisdom and strength as they carry a large burden together as a family to help the NTM-PNG team. Also, pray for the Centre Management Team, Garry and Sylvia Krobel, who are a huge blessing and are serving away from their four grown children who live in Canada. Mission life is so fulfilling and we all love our jobs very much, but we still need prayer to keep us content and focused when the pain begins to stab at our hearts. Thank you for all the prayers on our behalf as we traveled home to the ITU village and worked to finish Promise’s house. The team from Promise’s home church were amazing and stepped right in without missing a beat. They worked hard, tried all the local cuisine, encouraged us as a team and connected with our village church – especially the young men there – in an impactful way. We are so thankful for the Body of Christ…and for Promise’s new home next to ours. It’s nice to have her down near the church, the school, and the homes of some of our village church leadership. We are thankful for Bill Michaud here on the field who came in to begin the project a couple of months ago and for the team who finished it up this week. This is all a huge blessing! Thank you FBC! Please be in prayer for the Tanguat outreach and strategy. The gospel was presented over there several years ago, but through many circumstances the discipleship process stalled shortly thereafter. As a result, the Tanguat church hasn’t distinguished itself yet from the community and is immature, which allows immediate felt needs and strong (sometimes unbelieving) voices who are attending the church to drive their desires. The believers in G village long to be working together as a Body of Christ, but until the church and community are distinguished and some maturity takes place, it will be slow going. The believers came over and had a chance to talk with us and share their concerns some through tears. Bill was able to refer to Promise’s documented history of the G village’s pattern of inability over the last couple of years to follow directions and submit to literacy routines, church discipline, and the Bible teachers at times and how that has resulted in a failed literacy program, a struggling church, and a community that is constantly battling heavies among themselves. We also admitted some of the fault that lies with us as the missionary team for the discipleship ending prematurely and laying an extra burden on the ITU elders and teachers. The believers acknowledged all of this and asked for help once again. While we were home on furlough, Promise invited two new families to join her in finishing the Tanguat work. We are so thankful for the Chens and Swenson families who will be joining Promise to engage the G village church in a deeper way and lead them on to maturity. Please pray for Promise, the Chen and the Swenson families as they work to encourage, exhort, and disciple even now as they work on allocating. Please continue to pray for the Tanguat believers. They are precious to us…men and women who are enduring hardship and verbal/physical persecution for the sake of bringing the Word of God in its fullness into their language group. So, we wait and give a little time and ask the Lord to be gracious to those who need exactly what the Chen and Swenson families intend to bring to this church. The new missionaries were supposed to come in the day we flew out, but the team decided with the church that since their equipment for their saw mill hadn’t arrived yet, it would be best to postpone and allow some time for the G village to soak in the fact that they are not running the timeline and decisions for this and that they would have to accept help from the larger Body if they want new missionaries to come and finish the task.